Sennett was part of the Central New York Military Tract, land reserved for war veterans. In 1795, Daniel Sennett became the first settler. The town of Sennett was formed from the towns of Town of Brutus and Aurelius in 1827. Part of Sennett was used to contribute territory to the town of Throop in 1859. Sennett also contributed some of its southwest territory to the city of Auburn. The Sennett Federated Church and Parsonage, built in 1848, is listed on the National Register of Historic Places. According to the United States Census Bureau, the town has a total area of 28.8 square miles (74.7 km2), of which 0.023 square miles (0.06 km2), or 0.08%, is water. 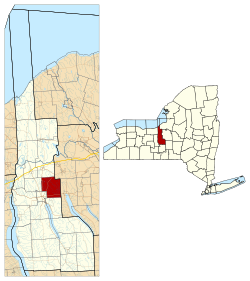 The east town line is the border of Onondaga County. 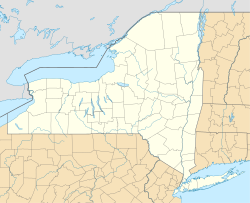 Sennett is in the Finger Lakes region, being near the north end of Owasco Lake and Skaneateles Lake. U.S. Route 20 is an east-west highway, New York State Route 5 is a northeast-southwest highway, and New York State Route 34 is a north-south highway, all of which converge in the city of Auburn. As of the census of 2000, there were 3,244 people, 1,085 households, and 864 families residing in the town. The population density was 112.6 people per square mile (43.5/km²). There were 1,117 housing units at an average density of 38.8 per square mile (15.0/km²). The racial makeup of the town was 96.02% White, 2.37% African American, 0.18% Native American, 0.86% Asian, 0.06% Pacific Islander, 0.03% from other races, and 0.46% from two or more races. Hispanic or Latino of any race were 0.65% of the population. There were 1,085 households out of which 36.5% had children under the age of 18 living with them, 69% were married couples living together, 7.5% had a female householder with no husband present, and 20.3% were non-families. 16.8% of all households were made up of individuals and 10% had someone living alone who was 65 years of age or older. The average household size was 2.75 and the average family size was 3.1. In the town, the population was spread out with 27.1% under the age of 18, 6.7% from 18 to 24, 25.8% from 25 to 44, 24.2% from 45 to 64, and 16.2% who were 65 years of age or older. The median age was 39 years. For every 100 females, there were 99.8 males. For every 100 females age 18 and over, there were 97 males. The median income for a household in the town was $50,282, and the median income for a family was $57,009. Males had a median income of $37,663 versus $24,479 for females. The per capita income for the town was $19,593. 4.9% of the population and 3.7% of families were below the poverty line. 6% of those under the age of 18 and 4.7% of those 65 and older were living below the poverty line. McMasters Corners – A location on NY-34, west of Sennett village. Sennett ( once "Fellows Corners") – The hamlet of Sennett is located on NY-5, northeast of Auburn. Wicks Corners – A hamlet by the east town line, east of Auburn. ^ a b "Geographic Identifiers: 2010 Demographic Profile Data (G001): Sennett town, Cayuga County, New York". U.S. Census Bureau, American Factfinder. Retrieved November 14, 2014. This page was last edited on 13 May 2018, at 23:40 (UTC).